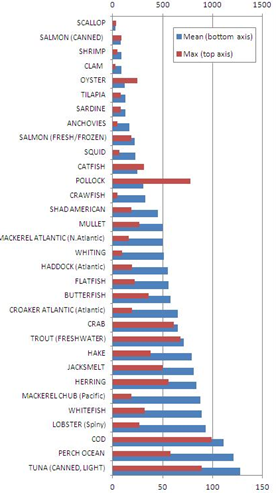 Farmed vs. Wild-Caught: Pollutants and A Low Omega-3/6 Ratio - Is Wild Caught Fish Always the Better Choice? Plus: Krill, Fish Oil, or Whole Fish - What's Best for Your Health? Wild caught or farmed? If you google it, it appears to be as if eating farmed fish could be worse than eating no fish at all, but is this actually true? Farmed fish is the ugly duckling in the "superfood" family. It is - at least that's what you'll read on the Internet - low in omega-3s, full of "bad" omega-6 fatty acids and laden with all sorts of pesticides. But wild caught fish is expensive and if we all ate it day in and day out not exactly eco-friendly, right? In today's SuppVersity special parts of which you may have recently seen pop up for a few hours in interview form over at www.fighterdiet.com, before Pauline Nordin and I decided that due to its length and complexity it was rather an article than an interview and should thus be published as such, I am going to tackle the issue of "farmed vs. wild-caught" and "fish vs. fish oil" from all possible angles. Do not underestimate fish as a protein source - fish is more than just omega-3! I would like to start my elaborations with the results of a recent paper by Nichols et al. (2014). A paper, in which the scientists investigate whether the existing differences of the fatty acid profiles from farm-raised vs. wild-caught cold-water fish would depend on what the fish were fed. 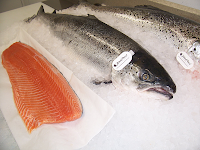 The general consensus on the Internet appears to be that wild-caught salmon is in all ways superior to its "industrially produced" counterpart from the large fish farms. In that, the opponents of farmed fish consumption usually highlight the (I quote) "exorbitant" amount of allegedly unhealthy omega-6 fatty acids in farmed fish. Now it is certainly undebatable that the ratio of omega-6 to omega-3 fatty acids in wild-caught vs. farmed salmon differs significantly. The previously mentioned study by researchers from the Commonwealth Scientific Industrial Research Organization does yet also show that this effect is not a result of "farming", per se. Rather than that, the increase in omega-6 and decrease in omega-3 fatty acids in today's industrially produced cold-water fish is a result of the ongoing reduction of the fish(oil) content in the fish food. In 2001, for example, when farmed barramundi (Lates calcifer | another cold-water fish that is raised in large aqua-farms these days) were still fed a high percentage of dietary fish oil, the farmed fish actually had a more favorable omega-3 to omega-6 ratio than its wild-caught counterpart (see Figure 1). Over the past 13 years, the fish farmers have yet replaced large amounts of the increasingly expensive fish oil in the feed by cheap poultry oils. The consequences are obvious: While this practice may reduce the levels of dioxins and dioxin‐like PCBs (Berntssen. 2005), the substitution of fish oil with vegetable oil in the feed lead to decreases in the total amount of PUFAs, most specifically omega-3s, though. Thus, the originally highly favorable omega-3/omega-6 ratios of 5:1 for farmed salmon and 3:1 for farmed barramundi has declined to a meager 1:1 (Nichols. 2014). High omega-6 in today's farmed cold-water fish - a problem? 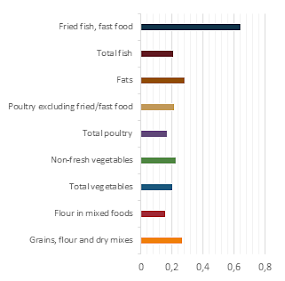 For the average physical culturist who is following a diet that is comparatively low in potentially pro-inflammatory omega-6 fatty acids (they are only bad for you, when they are consumed in excess), tehe deterioration of the omega-3 to omega-6 fatty acid ratio in modern farmed vs. wild caught fish is relatively unproblematic. Unlike it is the case for the average Westerner, who is in dare need of high omega-3 and low omega-6 foods to balance his or her excessive omega-6 intake from vegetable oils and industrially processed foods, farmed salmon is thus still a good source of protein and fats for those of us who are following a whole foods diet with a balanced fatty acid profile. So, if the relatively high omega-3 content is not a problem, because the effects of "high omega-6" farmed fish on your omega-3 to omega-6 ratio is still neutral (that's the case if the ratio is approx. 1) there is no reason to avoid farmed fish, right? Unfortunately the high omega-6 content is not the only problem farmed fish is supposed to have. Next to the previously discussed issue, the occurrence of various pollutants in farmed fish is another of the topics that will be mentioned in almost every online- or gym-debate on the consumption of farmed fish. Rumors have it that farmed salmon was loaded with toxic chemicals. And guess what!? To a certain extend that is absolutely true. When we are taking a closer look at the latest scientific evidence on the real world effects of thes persistent organic pollutants (POPs), it turns out that a high fish consumption has no measurable impact on the concentration of this potentially cancerous endocrine disruptors (they mess with your hormones) in our blood and adipose tissue. In fact, the latest study by Hausken et al. clearly indicates that the POPs in the blood of their fish fed subjects and the corresponding control group have different food products as their main sources (Hausken. 2014). It is thus no wonder that the researchers from the University of Bergen did not find any change in serum or adipose tissue POP levels, when they had their subjects, 42 outpatients with different metabolic disorders, increase their intake of farmed salmon or salmon oil and compared their subjects' serum and fat pollutant levels to a non-fish eating control group. The results were unambiguous: The consumption of farmed fish did not affect the steady-state of organic pollutants in either the blood or fat tissue of the subjects. High levels of persistent organic pollutant (POPs) - a problem? The ever-increasing amount of POPs in our diet and other consumer goods (deodorants, perfumes and cosmetics are another source of POP) is a problem and a potential threat to our health, but farmed fish is not the item on your plate or cupboard that will tip the scale. Due to the ever-increasing pollution of the oceans, rivers and lakes, POPs and other pollutants are no "farmed fish" phenomenon, anyway. If you look at the results of a recent study from the Hong Kong Baptist University, for example, you will have to concede that "eating wild caught only" is not going to protect you from being exposed to chemicals like BPA (Wei. 2011). Figure 3: Polycyclic aromatic hydrocarbon (PAH) content of farmed and wild-caught salmon samples (Easton. 2002). Moreover, the amount of organic pollutants in farmed fish could be easily reduced if the producers were willing to invest more money into quality fish food. The results of a 2002 study by Easton et al. clearly indicate for example that the increased polycyclic aromatic hydrocarbon (PAH) content of farmed vs. wild caught salmon could be easily reduced if these organic pollutants were not already present in hilariously high quantities in the feed the fish are fed. 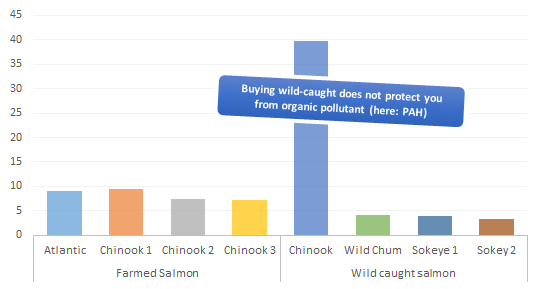 Buying uncontaminated fish food would thus give the farmers a degree of control fishers whose wild caught chinook salmon can contain up to 4.8x more PAH than farmed salmon (see Figure 3) will never have. Fish oil is a highly processed substance. If the processing is done right, it is possible to remove large parts of the previously discussed POPs, as well as inorganic pollutants like mercury from the fishy sludge. The fact that it can be pollutant-free, however, does not necessarily mean that your fish oil caps will actually be free of any harmful substances. The fact that fish oil producers may not do their job properly is yet not the only reason I am a strong proponent of consuming whole vs. "capped fish" and a whole foods vs. processed "supplement diet. Why? Well, fish is by far not the only so-called "superfoods" for which we have seen time and again that the isolation of certain ingredients, of which we think that they are what makes these foods so "super", is not going to yield the results we are looking for. In fact, recent studies which highlight the benefits of fish proteins for man and women who strive to build and maintain a muscular physique (learn more in a previous SuppVersity article) clearly suggest that the often-cited high selenium content of fish is not the only "good thing" you'd miss if you ditch your salmon, tuna and other fatty fish for cheap and convenient fish oil caps. Warning! "Whole fish" does not include fried fish as you will find it on a "fish mac" or fish & chips and/or fish sandwiches. An increased consumption of these "fish" meals has been shown not to influence the cardiovascular mortality risk of 3910 adults aged 65+ years in a 2003 study by Mozaffarian et al. Moreover, the previously discussed amount of environmental pollutants in the fish is another determinant of its beneficial health effects. In an editorial comment in the Journal of Internal Medicine Jacobs, Ruzzin & Lee highlight that "[t]he evidence that environmental pollutants can affect the health benefits of fish is supported by previous experimental studies" (Jacobs. 2014). In rodent studies, only decontaminated farmed salmon oil ameliorated the negative effects of high fat feeding. A POP-laden salmon oil from Atlantic salmon, on the other hand, accelerated the development of insulin resistance-related disorders in the lab animals (Ibrahim. 2011). The question, whether we should eat fish and take fish oil supplements is thus intricately related to the question whether we can obtain POP-free fish and fish oil products. Table 1: The amount of organochlorides in various types of fish oil supplements bought on the Canadian market can be significant - similar results have been found on other markets | aΣ of 1,2,3,4 tetrachlorobenzene, 1,2,3,5 tetrachlorobenzene, and pentachlorobenzene; bΣ of α-HCH, β-HCH, and γ-HCH; cΣ of oxychlordane, trans-chlordane, trans-nonachlor, and cis-nonachlor; dΣ of p,p′-DDT and p,p′-DDE.(Rawn. 2009). And even if you're not interested in being muscular, a recent study by Brazionis et al. clearly suggests that getting your 1g of long-chain omega-3 fatty acids from fish vs. fish oil supplements "may have additional cardiovascular benefits beyond the omega-3 effect". Effects which lead to a significant reduction in blood pressure the scientists observed only in those subjects who consumed fresh salmon (two 150 g servings per week of John West fresh Atlantic salmon), but not in their peers in the fish oil arm of the study (Brazionis. 2012). Is fish oil the safer alternative? If you buy your fish oil from a manufacturer who can prove that each and every batch is tested for its POP and heavy metal content, it may be safer, but in view of the synergistic effects of protein, fat, certain peptides and a plethora of micronutrients you will be missing if you scrap your two weekly servings of fatty fish and turn to fish oil caps instead, this does not mean that it will be healthier. When we are talking about toxic substances in fish and fish oils, we obviously cannot dismiss the heavily debated issue of heavy metal contaminations. Heavy metals are clearly no farmed-fish exclusive! While the heavy metal issue is still a matter of open scientific debate, the epidemiological evidence in favor of the profound health effects of regular fish consumption appears to suggest that it is less of an issue for the general population than the hysteric news on the Internet may make you believe. For fitness junkies and bodybuilders who are trying to satisfy their alleged protein "requirements" of 3-4g of protein per kg body weight by shoveling down one can of tuna after the other, however, the heavy metal content of the cheap fish cans may become a problem. Or maybe I should say: I personally would not use canned tuna as my primary protein source, when aiming for a protein intake of 3-4g per kg of body weight. And this goes regardless of the fact that I believe that the risks associated with consuming tuna containing 0.10-0.75ppm methyl mercury (Yess. 1993) may be overblown in some of the sensationalist articles on the Internet and other mainstream media. Similarly, I am reluctant to rely on the purported protective effect of the high amounts of cysteine and selenium in seafood. A protection, by the way, of which scientists have recently shown that is cannot mitigate the loss of cardioprotective effects of high omega-3 intakes in individuals with high hair mercury levels (Virtanen. 2009 | learn more). So mercury is less on an issue than people claim? Probably yes. I would subscribe to the FDA recommendation to limit your fish intake to 2-3x fish meals a week. More specifically, you should forget about the idea of tuna as a "healthy snack" you can eat as often as you want to and stay away from more than one fish meal if you are pregnant or trying to become pregnant. In this case buying either mercury controlled fish or fish oils may in fact be the better choice – I mean: "Better safe than sorry", right? Speaking of fish oil, there is an increasing trend towards krill oil as the "hype" omega-3 supplement. A trend of which you, as SuppVersity readers know that it appears to be unwarranted, although krill oil has the advantage of providing a large amount of the omega-3 fatty acids in their phospholipid-bound form (learn more in a previous SuppVersity article). Compared to triglycerides, the phospholipid-bound version is easier to assimilate. Accordingly, it is not very surprising that Rossmeisl. et al. (2012) were able to show that phospholipid-bound long-chain omega-3 fatty acids increase the plasma and liver omega-3 content to a significantly greater degree than the same amount of triglyceride-bound omega-3 fatty acids. An effect that was – at least in rodent studies – associated with a significantly more pronounced reduction in fat cell size and insulin sensitivity (Rossmeisl. 2012). A more recent study by Tillander et al. (2014) adds to the evidence that krill oil may have an edge over fish oil, as an anti-NAFLD agent, because it will epigenetically reduce the fatty acid synthesis in the liver (read more). The very ability to reduce the synthesis of fatty acids in the liver makes krill oil particularly interesting for overweight and obese people. The increased fatty acid oxidation in response to the ingestion of fish oil (vs. krill oil) the researchers observed in the same study, on the other hand, may be something that could be of interest for lean individuals who are trying to lose weight (learn more in previous SuppVersity article). Fish or krill? It depends... The previously presented evidence does thus make one thing very clear: It is more than likely that it will depend on your goals and current health status which of these omega-3 sources you should prefer. Overall, there is yet still a paucity of independent research, which is why I would not be surprised if the previously made conclusions were refuted by future studies. If not weight loss, but muscle gains and fat loss are your goal, though, neither fish nor krill oil will do - at least not in the absence of one of the previously mentioned synergists: Fish protein! Fish protein, an overlooked anabolic? What wanna-be bobybuilders need is protein. Fish protein, to be precise. In 2009, for example, Ramel et al. were among the first to observe that using fish, or more specifically cod protein as the major protein source in the diet of their overweight subjects would yield improved outcomes in terms of fat loss and lean mass retention (Ramel. 2009; see Figure 6). 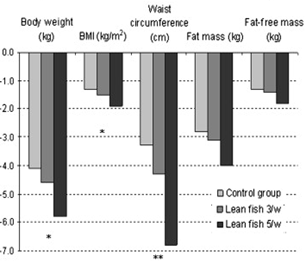 Figure 6: Decreases in anthropometric measurements after the 8-week intervention with isocaloric energy reduced diets having in obese subjects consuming no, three or five servings of lean fish per week (Ramel. 2009). It is thus quite obvious that there must be something special to fish proteins more common dietary protein sources do not provide. This hypothesis is also supported by previous evidence from rodent studies. One of these studies that was conducted by Frédéric Tremblay et al. (2003) at the Laval University Hospital Research Center suggests that the benefits may be related to the potent anti-inflammatory effects of fish proteins, which will thus increase the muscular insulin sensitivity and favor fat over muscle loss and muscle over fat gain. A more recent study by Vikøren et al. (2013) seems to confirm this hypothesis. The overweight adults who participated in the corresponding experiment experienced significant improvements in glucose metabolism, increases in lean and decreases in fat mass, when the scientists added 3 g of fish protein per day to their diets for the first 4 weeks and 6 g/d for the last 4 weeks of the 8 week intervention. What is particularly noteworthy about this study is the fact that these effects occurred in spite of the fact that "[p]hysical activity and energy and macronutrients intake did not change during the course of the study" (Vikøren. 2013). More recent evidence from a rodent study by Kawabata et al. (2014) strengthens the "anti-inflammatory" hypothesis. In their experiments, the researchers compared the effects of casein and fish protein in a tightly controlled dietary intervention and found similar increases in muscle mass and improvements in glucose metabolism in their hairy subjects as Vikøren et al. did one year before in overweight adults (learn more in a recent SuppVersity article). Why don't we use our consumer money to force producers to make a change? I hope my previous elaborations have made it clear that living off fish as your only protein and fat source in the diet is probably not the best idea. On the other hand, similar issues with antibiotics (ab)use, persistent organic pollutants (POP) and even mercury exist for other foods, as well – with the exception of antibiotics which are only used to produce animal products all these pollutants can also be found in veggies and fruits (so no "vegan advantage"). We would thus be good advised to use our most powerful weapon, i.e. consumer money, to steer the food industry away from doing everything to cut the production costs and buy fish from those farms that don't use cheap poultry instead of fish oils, intoxicate the water with antibiotics and buy the cheapest, yet POP-laden food from questionable sources in China to feed their fish. 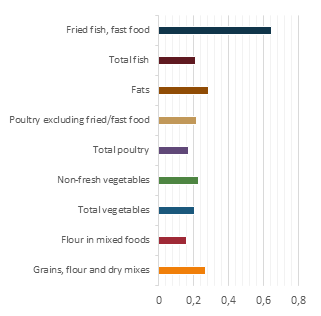 Time to draw some conclusions: Based on the existing evidence there is no reason to shy away from either fish consumption, in general, or the consumption of farmed fish, in particular. The overwhelming majority of epidemiological evidence indicates that consuming two servings of fatty fish a week will have nothing but beneficial effects on your overall health and that in spite of the fact that the fish was not controlled for organic or inorganic pollutants in any of these studies. Whether it makes sense to consume large quantities of fish on a daily basis is yet as questionable as the routine use of fish oil supplements. Most of us will be able to cover our fundamental omega-3 needs with the previously mentioned two servings of fish per week. Consuming more than that in supplemental form is – in my humble opinion – not necessary for healthy individuals, unless they need to balance their exuberant intake of omega-6 fatty acid from large quantities of vegetable oils and processed foods in their diets –both products of which I highly recommend that people limit their intake to a minimum. Moreover, imbalanced diets that are dominated by a single food source have repeatedly been shown to increase one's risk of running into severe health problems in the long run. So why don't we combine fish with dairy products, grass fed beef, pork and vegetable protein sources to create a varied, tasty, health and physique promoting high protein diet we can follow for the rest of your lives, instead of looking for the one "superfood", of which I would hope that most of the people who read this interview will know by now that it doesn't exist, anyway. Brazionis, Laima, et al. "The effects of fish or fish oil on the omega‐3 index." Nutrition & Dietetics 69.1 (2012): 5-12. Berntssen, Marc HG, ANNE‐KATRINE LUNDEBYE, and Bente E. Torstensen. "Reducing the levels of dioxins and dioxin‐like PCBs in farmed Atlantic salmon by substitution of fish oil with vegetable oil in the feed." Aquaculture Nutrition 11.3 (2005): 219-231. Easton, M. D. L., D. Luszniak, and E. Von der Geest. "Preliminary examination of contaminant loadings in farmed salmon, wild salmon and commercial salmon feed." Chemosphere 46.7 (2002): 1053-1074. Hausken, Trygve, et al. "High Consumption of Farmed Salmon Does Not Disrupt the Steady State of Persistent Organic Pollutants (POP) in Human Plasma and Adipose Tissue." Journal of Toxicology and Environmental Health, Part A 77.20 (2014): 1229-1250. Ibrahim, Mohammad Madani, et al. "Chronic consumption of farmed salmon containing persistent organic pollutants causes insulin resistance and obesity in mice." PloS one 6.9 (2011): e25170. Mervish, Nancy, et al. "Dietary predictors of urinary environmental biomarkers in young girls, BCERP, 2004–7." Environmental Research 133 (2014): 12-19. Mozaffarian, Dariush, et al. "Cardiac benefits of fish consumption may depend on the type of fish meal consumed the cardiovascular health study." Circulation 107.10 (2003): 1372-1377. Nichols, Peter D., et al. "Readily available sources of long-chain omega-3 oils: is farmed Australian seafood a better source of the good oil than wild-caught seafood?." Nutrients 6.3 (2014): 1063-1079. Rawn, Dorothea FK, et al. "Persistent organic pollutants in fish oil supplements on the Canadian market: polychlorinated biphenyls and organochlorine insecticides." Journal of food science 74.1 (2009): T14-T19. Rossmeisl, Martin, et al. "Metabolic effects of n-3 PUFA as phospholipids are superior to triglycerides in mice fed a high-fat diet: possible role of endocannabinoids." PLoS One 7.6 (2012): e38834. Tillander, Veronika, et al. "Fish oil and krill oil supplementations differentially regulate lipid catabolic and synthetic pathways in mice." Gene expression 24 (2014): 28. Tremblay, Frédéric, et al. "Dietary cod protein restores insulin-induced activation of phosphatidylinositol 3-kinase/Akt and GLUT4 translocation to the T-tubules in skeletal muscle of high-fat-fed obese rats." Diabetes 52.1 (2003): 29-37. Vikøren, Linn A., et al. "A randomised study on the effects of fish protein supplement on glucose tolerance, lipids and body composition in overweight adults." British Journal of Nutrition 109.04 (2013): 648-657. Virtanen, Jyrki K., et al. "Serum long-chain n-3 polyunsaturated fatty acids and risk of hospital diagnosis of atrial fibrillation in men." Circulation 120.23 (2009): 2315-2321. Wei, Xi, et al. "Assessment of risk to humans of bisphenol A in marine and freshwater fish from Pearl River Delta, China." Chemosphere 85.1 (2011): 122-128. Yess, N. J. "US Food and Drug Administration survey of methyl mercury in canned tuna." Journal of AOAC International 76.1 (1993): 36.